A HUGE HUGE GIANT congratulations to Brandon Beach in Senate 21. A dedicated grassroots effort pulled it out. I always find it a tad more glorious when politicians lose out after vacating a seat to seek a “better” or “more powerful” position. Not only did Will the Winner cost taxpayers thousands after we just had a primary in July, Jerguson added to that cost by abandoning his seat after he was also challenged in July. Clearly, the voters wanted him as a Rep, and told him so in July. He got a bit antsy… Now he has nada. Had it not been for his abandonment, however, true public servant Scot Turner would not have had the opportunity to run again and give the people of Cherokee substantial representation. While it’s unfortunate that Turner was just shy of the 50%+1 vote, I’m confident he can pull out a win against not-so-organized, barely-able-to-overcome-a-Dem-in-Cherokee Brian Laurens in the runoff. Besides, Turner was the only one who cared enough to challenge an incumbent in July’s primary. So, it continues…but we know how I really feel. 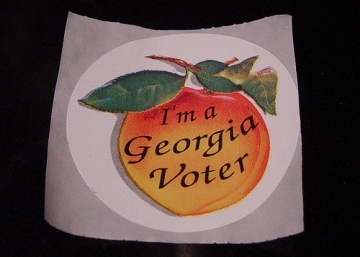 This entry was posted in Elections, Georgia and tagged Brandon Beach, Brian Laurens, Chip Rogers, House 21, Scot Turner, Sean Jerguson, senate 21 on January 9, 2013 by Jessica Szilagyi.